On the heels of what may be considered a crucial election, Hofesh Shechter Company comes to Minneapolis with Political Mother. In the newest installment of TALK DANCE, local dancer and choreographer Justin Jones interviews choreographer and artistic director Hofesh Shechter about politics, art, and influence. Born and raised in Jerusalem, Shechter grew up in a tense political environment, which he admits may have a subconscious impact on his work, as well as his worldview. Growing up, Shechter began dancing Israeli folk dances, later joining Bat Sheva Dance Company, and then moved on to music, studying drumming. Shechter’s diverse artistic background helps him draw inspiration from music, his childhood, his current outlook on dance and politics, relationships, his aesthetic preferences, and so much more. Throughout the interview, he makes profound statements that are engaging, thought provoking, and often infuriating – at one point he claims that dance is apolitical! In a revealing section, Jones and Shechter dig deep into the role of politics and society on relationships and the political process, which Shechter views as merely giving people the illusion of power and influence where perhaps they have none. Justin Jones: One of the realities that I was noticing as I was watching a video of the work, was the reality of being part of a society and the reality of being part of a relationship between two people. And the conflict and contrast between those two things and how large social movements have interesting and unexpected ramifications in your personal life or your relationships with just one person. You really feel people existing in both of those situations simultaneously in the work. 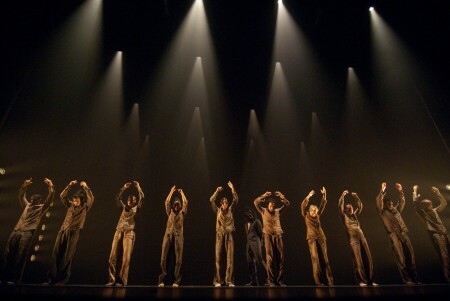 Hofesh Shechter: Yeah, I mean, you know, we can get into, sort of, philosophical conversations about it. You could say that everything we do is defined by the society we grew in, and it’s pretty obvious. But, to think that it also affects our most deep emotions, and the way that we treat each other, is just a bit of a scary thought. And I think one of the questions Political Mother may raise to some people that watch it is whether the emotional connections we have with other people, how much of these are really affected by our social conditioning? And how much of it is actually natural, instinctive? And how much of the natural and instinctive is being used and abused by the systems that ask us to serve them? So, I think it’s a very complex world of emotions and needs and conditioning. Which, I don’t know if it has a real answer or solution, but I find that Political Mother may raise these questions for people that watch it – or these emotions. JJ: It’s really interesting to me, also, that this work is touring the United States very close to our election. You brought up the word “need” and that is a word that I’ve read you using in interviews talking about neediness – the neediness between people and others, the neediness between people and their governments. That’s actually become one of the main issues of our election, in the US, this idea role of government in our lives and how and should people depend on government or not. I’m curious about how you relate to that issue in Britain. Additionally, Shechter describes the collision of dance and music in Political Mother. He explains how his experiences as a drummer brought him to England, influence his choreography, and drive the intense (and fast!) movement. You can watch a preview of the work here. Political Mother is co-presented with Northrop Dance at the Orpheum Theatre on Tuesday, November 13th at 7:30 pm. Tickets are available via Ticketmaster/ Hennepin Theatre Trust or you can avoid processing fees by purchasing tickets in person at the State Theatre Box Office, 805 Hennepin Avenue, Minneapolis, or by calling 612-339-7007 .